Yes, this is certainly possible. The title of the Family Group Record, as well as any other report, can be customized to your liking. The image below shows the Family Group Record screen (Reports icon > Family tab). Notice at the end of the title is the [FullName] code. This is there by default. You do not need to touch this unless you want to customize the title. You could replace the code with the actual names of the couple that you want to display in title. I would not recommend this however, because when you go to print a Family Group Record for a different family, the same couple name will still be there. Rather, just add the [CoupleNames] code and preview/print the report. The great thing about using these kind of codes in the title field is that the next time you create the same report, the title will retain your customization, so you'll always get a title you like. [Fullname] - The name of the current individual in given name-surname order. Use for individual type reports. [Firstname] - The first given name of the current individual or the quoted name if the Use Quoted Name option is selected. [Givennames] - The given names of the current individual. [Surname] - The surname of the current individual. [HisHer] - "his" or "her" depending on the gender of the current individual. [~HisHer] - "His" or "Her" depending on the gender of the current individual. [HisHers] - "his" or "hers" depending on the gender of the current individual. [~HisHers] - "His" or "Hers" depending on the gender of the current individual. [HLifespan] - The life span years for the current husband. [WLifespan] - The life span years for the current wife. [CR] - Inserts a carriage return in the title to assure it prints on multiple lines. Use the following fields when doing marriage-type reports. [HusbSurname] - The surname of the husband. [HusbGivenNames] - The given names of the husband. [HusbFirstName] - The first word in the Given Names field of the husband. [HusbSurname, Given] - The husband's name in Surname, Given order. [HusbPrefix] - The title prefix for the husband. [HusbSuffix] - The title suffix for the husband. [HusbUID] - The User ID# for the husband. [WifeFullname] - The name of the wife in given name-surname order. [WifeSurname] - The surname of the wife. [WifeGivenNames] - The given names of the wife. [WifeFirstName] - The first word in the Given Names field of the wife. [WifeSurname, Given] - The wife's name in Surname, Given order. [WifePrefix] - The title prefix for the wife. [WifeSuffix] - The title suffix for the wife. [WifeUID] - The User ID# for the wife. [MRIN] - The record ID number for the marriage. [CoupleNames] - The husband and wife names together. For example: Albert Berdan and Susannah Secord. [CoupleNames, Lifespan] - The husband and wife names together with their life span years after each name. For example: Albert Berdan (1753-1818) and Susannah Secord (1759- ). FamilySearch continues its massive record digitization projects. They have just added over 6 million new indexed records and 1.4 million new images to its Record Search pilot program. I met and proposed to my wife in a Family History Center (two separate days). Naturally, I thought we would spend a life together researching each other's roots. I later found out that she was just there for the student employment (the Family History Center was in a library of a university) and had little interest in genealogy. We still got married, and I am still trying to convince her to love genealogy as much as I do. Over the years I have learned a few dos and don'ts for "persuading" my family that genealogy is fun. 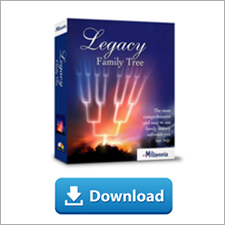 In fact, Legacy Family Tree has many tools that has made this task easier for me. I am working on an article to be used for a conference syllabus which explains some of these ideas. I hope you will read it and publish your comments here regarding what has worked for you. Click here to download the article (891kb, pdf). While you are traveling the world, you will also learn about Legacy and other genealogy technology directly from the Legacy developers. 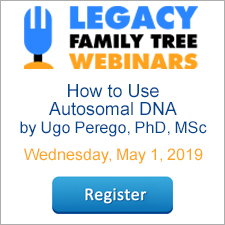 In 12 hours of personalized instruction, you will learn many of the powerful features of Legacy that will really help you advance your genealogy research. Naturally, there are ancient cities, castles, museums and cobblestone streets at every turn. And the boutiques down the street are waiting to be discovered. Experience Europe the way you've always dreamed from your balcony stateroom on the Norwegian Jade this fall. You will drive by landmarks such as Trajan's Column, the Arch of Constantine, Circus Maximus, the Colosseum and the Roman Forum. If there is one memory you will take home with you, it is of drifting through Venice's canals on a gondola as darkened waters lap your boat and music melts on the air. A scenic drive, of Amalfi coast then on to Pompeii, where you'll visit the Roman resort buried by volcanic ash. Plaster casts mark the positions of the fallen, who were swiftly overcome by the ashes. Have the opportunity to admire some of the most important sites of Athens, including the Acropolis - one of the most photographed and recognizable hills in the entire world. Drive through the Turkish countryside along a hilly road to arrive at the House of Virgin Mary; the site where the Blessed Virgin is reputed to have spent the last years of her life. This trip will be one of a lifetime to remember! Norwegian Jade has 10 international restaurants. So take your pick, you could dine when and with whom you choose. Add to that the most innovative accommodations on the high seas, and you’ll see there’s no limit to the Freestyle choices for fun and relaxation aboard Norwegian Jade. Click here for pictures and descriptions of each of the places we will visit. Prices start at US $1,159 per person. If you want more information, contact our travel agency, AA Travel Time at 1-888-505-6997 or send an e-mail to book@aatraveltime.com. Germany, Netherlands, and the Philippines will find some nice surprises in the newly added collections. particular have been anxiously awaiting the 23 million records from the Irish Civil Registration indexes. These records date from 1845-1958 and are also known as the Statutory Registration Records. Statutory registration for Protestants began in 1845 and for Catholics in 1864.